On a hot summer day, there’s almost no better place than the pool. So when you’ve exhausted all other options—the park, the sprinkler, the comfort of your own home with the air conditioning blasting—pack your child a towel, help them put on their best suit (and sunscreen! )and head to the closest watering hole. But before you take a dip, make sure you’re well versed in the poolside safety dos and don’ts. According to the experts at St. Christopher’s Hospital for Children, accidental drowning is one of the most serious accidents that can occur in the summer months, and children ages one to four are most at-risk. 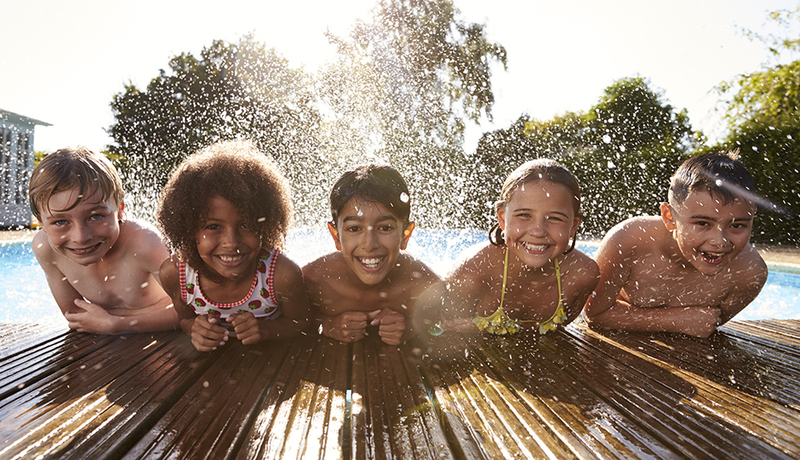 “An accidental drowning can happen fast, and parents need to be prepared,” says Evan Weiner, MD, and Director of Emergency Medicine. To learn how to avoid a pool-related emergency situation, read the tips below, care of the St. Christopher’s team. Don’t rely on floaties. According to Dr. Weiner, constant adult supervision is paramount to pool safety. Bundling your child in wearable flotation devices is not enough. “Parents should remember that ‘swimmies’ or ‘wings’ are not approved safety devices,” he says. They essentially act as swim training accessories, and should not be relied on to keep children safe. Do get certified in CPR, every year. Of course, the hope is this you’ll never have to use it, but this is one non-negotiable skill when you’re taking a child for a swim. CPR is a series of chest compressions and breaths proven to help resuscitate a child or adult in the case of asphyxiation. Make sure you’re trained in the differences between infant, child and adult CPR, and renew your certifications yearly. Don’t break the rules. Waiting to digest before you dip in is low on the list, but when it comes to the more official pool rules: diving, running, jumping, and when not to do them, heed the laws of the land. If there’s a sign put in place, it’s probably there for a reason. Remind your child regularly, and let them know all cool kids follow the (very necessary) rules. Do keep your guard up. “If you have your own pool, set up a fence or barrier. The fence or barrier should go completely around the entire pool,” says Dr. Weiner. The standard height for fencing is four feet or higher, and while public swimming pools are required by law to have barriers in place, it is, of course, a good idea to double check. Most pool supply stores offer fencing, alarm systems, pool covers and other safety devices to prevent easy access. If drowning occurs, it is important to call 911 immediately. For any serious water-related injuries, the experienced staff at St. Christopher’s Hospital is ready to help.